Ketchikan, Alaska - The state has signed two agreements with the U.S. Forest Service to cooperate in revising the Tongass Land Management Plan to satisfy a Ninth Circuit Court decision and to find a long-term supply of economic timber for the state's timber industry. After a series of meetings, the state signed two memoranda of understanding with the Forest Service pledging to cooperate in revitalizing the timber industry. Under the terms of one MOU, the state and Forest Service pledge to work cooperatively in reviewing the forest plan. Specifically, the state would assist in reviewing the forest plan's old growth conservation strategy, goshawk monitoring data, timber demand analysis and other topics related to the forest plan revisions. These areas were cited in the U.S. Court of Appeals for the Ninth Circuit decision in Natural Resources Defense Council v. U.S. Forest Service. The second MOU outlines a pledge to develop economically and technically viable timber sales on the Tongass National Forest to provide a sustainable amount of timber for Southeast mills over time. 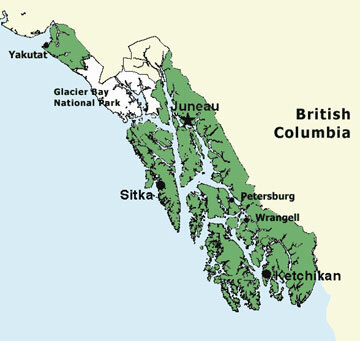 Both parties also agreed to work together to identify a sustainable source of economic timber to support the timber-dependent communities of Southeast Alaska. "Restrictions on timber harvest and barriers to the Forest Service implementing their 1997 plan has had a severe economic impact on Southeast Alaska communities," Gov. Frank H. Murkowski said. "Our goal is to stabilize and grow an integrated industry having an allowable sale quantity of at least 360 million board feet. This will hopefully bring new mills to Southeast Alaska." Sen. Bert Stedman representing Senate District A, which includes the Southeast communities of Ketchikan, Sitka, Wrangell and Petersburg, voiced his strong support of the Murkowski Administration's two pronged approach to improving the long-term supply of economically viable timber from the Tongass National Forest. "Since the beginning of last year, we've been actively working with the Alaska Forest Association and its members to come up with remedies to the chronic shortage of viable timber from the Tongass" Stedman said. "I share the Governor's vision for increasing our timber supply and his willingness to put the full force of the state behind sustainable 10-year Tongass timber sales". The Tongass is one of the best-managed National Forests in the world, but fifteen years of legal, regulatory and bureaucratic restrictions have crippled the timber industry in Southeast Alaska said Stedman. The signings of the two Memorandums of Understanding (MOU) with the U.S. Forest Service are directed at resolving some of these issues. One is a pledge to work cooperatively to identify a sustainable source of economically and technically viable timber to support the 30 plus timber-dependent communities in Southeast Alaska. The second calls for the state to work with the Forest Service in revising the Tongass Land Management Plan (TLMP) and in resolving issues raised by the Ninth Circuit Court of Appeals' in Natural Resources Defense Council v. U.S. Forest Service. Stedman said, "Despite the timber industry's best efforts, we continue to be stymied by the Forest Service's inability to implement the 1997 TLMP in a way that ensures a sustainable level of activity on the Tongass. These MOUs are a significant step towards resolving this problem". The state and Forest Service agree that in the short term they will work cooperatively to identify a supply of timber critical to aid Southeast mills. In the long-term they will work cooperatively to incorporate economic feasibility considerations into timber sales.